The X-Cite 120LEDBoost is more powerful than ever and efficiently excites a greater range of fluorophores than the original X-Cite 120LED, with no compromise. 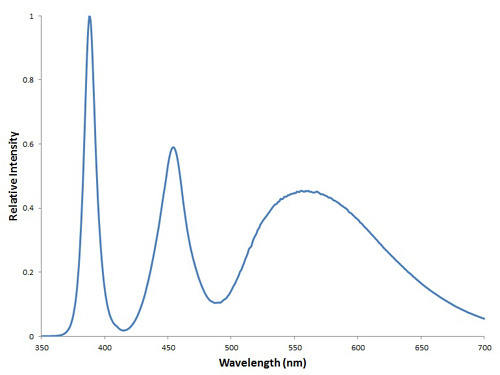 Even the popular red fluorophores are no challenge for the X-Cite 120LEDBoost. The X-Cite 120LEDBoost offers superior optical power and exceptional field uniformity at the specimen level with the broadest spectrum of fluorescence illumination through manual, PC and TTL control. With LEDs guaranteed for 25,000 hours and no lamps or modules to replace, X-Cite 120LEDBoostoffers sheer simplicity and convenience to researchers allowing them to focus on their experiments instead of equipment maintenance. The X-Cite 120LEDBoost fluorescence light source is designed for optimal imaging and data reliability, providing superior illumination uniformity with maximum stability over time. The X-Cite 120LEDBoost provides broad-spectrum excitation (370-700nm) with high-powered optical output. LED fluorescence illuminators are an excellent choice of a microscope light source due to their ability to provide instant illumination and at full intensity as soon as they are turned on, as well as having outstanding temporal and spatial stability. In contrast, incandescent and arc lamps require a significant warm-up period for the temperature of the lamp and the intensity of illumination to stabilize. This stabilization period, which can be up to an hour for some lamps, is required in order to ensure the illumination intensity remains consistent for the gathering of time-lapsed video segments and reproducible measurements. The stabilization period of LED microscope light sources like the X-Cite 120LEDBoost lasts merely a few microseconds, which saves on electricity, reduces delays prior to data collection, and allows more efficient use of microscope systems. Another benefit of LED light sources for fluorescence illumination is that they can be turned on or off as often as required with no effects on their impressive longevity. The LEDs in the X-Cite 120LEDBoost are guaranteed for three years (25,000 hours) with ultrafast shuttering capability. This feature is particularly important for protecting specimens in live cell imaging, where overexposure to light can cause phototoxicity or photobleaching of the fluorescent protein or dye. Precise management of the light intensity and the X-Cite 120LEDBoost’s on/off response times of 1ms or less provide the control needed to protect live cells. The X-Cite product family of illumination systems is designed specifically for fluorescence microscopy. The thermal management of the X-Cite 120LEDBoost is innovatively designed to allow direct coupling between the microscope light source and the microscope for maximum optical power without additional vibration. With the X-Cite 120LEDBoost, there are no bulbs or modules to install. The LEDs in the microscope light source are rated to 25,000 hours, and there are no consumable components. Over the lifetime of the microscope illuminator, this translates into cost savings on replacement bulbs, light guides, and reduced microscope downtime. Therefore, researchers can focus on their experiments rather than on equipment maintenance. The X-Cite 120LEDBoost raises the bar for convenience and ease in fluorescence excitation. Multiple control options are available for the X-Cite 120LEDBoost, making it suitable for any fluorescence illumination set-up. For multi-day time-lapse experiments, the X-Cite 120LEDBoost can be fully automated, yet it can also be controlled with an intuitive and ergonomic manual SpeedDIAL. 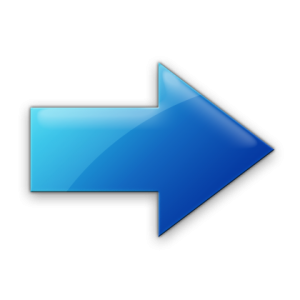 When connecting the X-Cite 120LEDBoost to a PC or triggering via TTL, LED on/off response times as short as 50µs can be achieved. 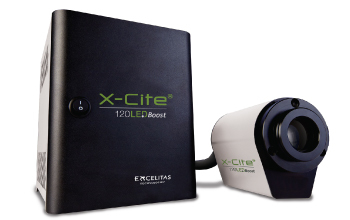 The X-Cite 120LEDBoost is the perfect mercury-free option for most fluorescence imaging applications. The X-Cite 120LEDBoost’s microscope light source delivers broad-spectrum, high-power fluorescence excitation from 370-700nm, which is applicable to a wide variety of commonly used fluorophores and fluorescent proteins. Superbly engineered direct coupling optics guarantee a bright, uniform microscope light source for microscopes from all major manufacturers.